Beautiful, quality thank you cards by Angie Makes. This assorted greeting cards collection includes 36 4x6 inch thank you notes with rustic, burlap, eco-friendly, brown kraft envelopes. Envelopes have a sticky glue seal. The cute, shabby chic, watercolour floral designs printed on sturdy card stock will make you smile. This folded cards set provides the perfect way to express your thanks and gratitude with the beauty of a unique, handwritten note / message. Perfect for all occasions and every age! A blank inside allows you to easily add your customized, heartfelt greeting. Angie Makes florals are painted and illustrated by hand then digitized so that our finished products are modern, artistically striking, and have the perfect handmade touch. You'll seriously love the quality and colors. Your purchase supports a work-from-home momma and family business committed to details, quality, and great design. 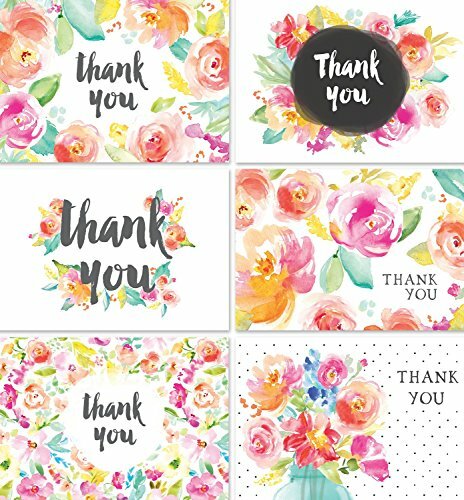 ♥ PERFECT FOR ALL OCCASIONS - Use these Pretty, Blank Thank You Cards for Baby Shower Thank You Notes, Birthdays, Teacher Appreciation, Business, Weddings, Bridal Showers / Wedding Showers, Kids, Graduation, Funerals, and more! ♥ BULK CARDS SET - With 36 Assorted Thank You Notes and Brown Kraft envelopes Included, You'll Always Have a Go-To Thank You Card on Hand to Send for Any Reason at All -- An Excellent Value and Way to Say "Thank You" with a Personal Touch. ♥ COMMITTED TO QUALITY - You'll Love the Premium Feel of These Sturdy Thank You Notes and Envelopes. Comes in a Set of 36 Folded Cards with Kraft Envelopes. Paper is High-Quality, 250gsm (140 lb) Matte Card Stock and Envelopes are 230gsm Brown, Kraft Paper. If, For Some Reason, You are not Satisfied with Your Purchase, We're Happy to Offer a Full Refund.